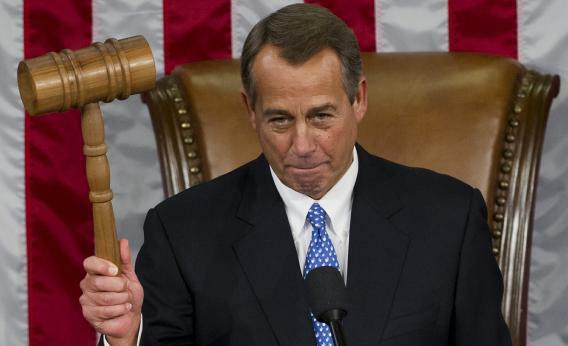 The Hastert Rule: Speaker Boehner needs to scrap “the majority of the majority” principle. The 113th Congress was sworn in today, leaving to the harsh critique of historians the 112th Congress. It likely to be remembered as among the least useful in memory. Rabid voices in both chambers were able to stop everything from confirmations to treaties to meaningful negotiations on taxes and spending and the debt ceiling. Two changes are needed, one in each chamber, to restore the legislative branch to its useful role as a deliberative body rather than a forum for hostage taking. In the Senate, filibuster reform is the key. We will know by the end of January if Senator Majority Leader Reid is willing to push for genuine reform. While the needed rule changes would ordinarily have to be made in the first few days of the new Congress, Sen. Reid has kept the window open until late in the month. I am not pleased at the delay. It signals that there may not already be enough votes for reform immediately, or that Reid is keeping filibuster reform as a card to play in the month of debt ceiling negotiations with Senate Minority Leader McConnell. Either way, I am not comforted. In the House, the filibuster equivalent has been the Hastert rule, an informal Republican principle under which the speaker permits to the floor for a vote only bills that have majority support of the majority party. This has empowered the extreme right wing of the Republican Party. Speaker John Boehner ignored the Hastert rule in permitting the legislation that overcame the “fiscal cliff” to get to the floor. The bill passed with only 85 Republican votes, drawing most of its support from the Democratic side of the aisle. Boehner was then barely re-elected as speaker. If the House is to permit reasoned centrist bills to move forward, it must get comfortable with ignoring the Hastert rule. That would permit a centrist coalition of Democrats and Republicans to circumvent the Tea Party wing. If the filibuster and the Hastert rule are not overcome, the 113th Congress will begin very quickly to look like the 112th, and we will all lose.